A lengthy, covered rose bush arbor from east to west borders the Patriotic Garden at Victoria Educational Gardens. There are built-in benches for comfort and viewing numerous scented varieties along with other plants. 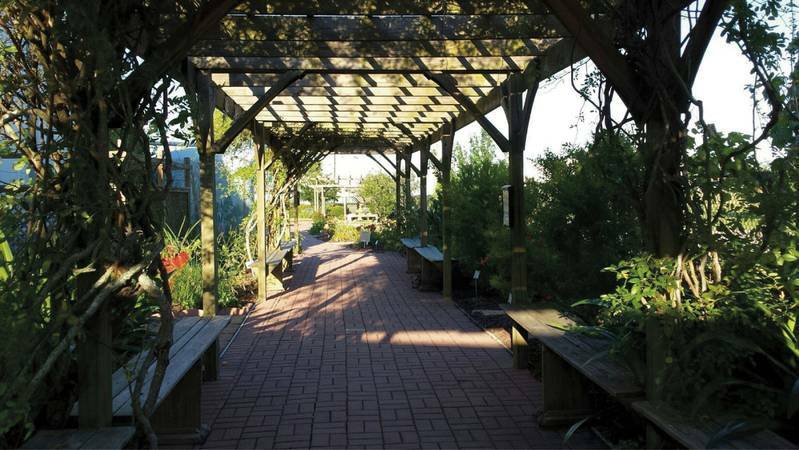 It serves as a covered walkway between sections of Victoria Educational Gardens that have been designed, planted and maintained by Victoria County Master Gardeners since the garden project began in 2003-04. We moved to Victoria more than 40 years ago. Back then, the city was developing into the destination it is today. Our family fun on the weekends was to load our two older daughters onto the backs of our bikes and cycle down to Riverside Park. Nowadays, there are many things to do. One destination is the Master Gardener Victoria Educational Gardens at the back of Victoria Regional Airport across from the airport control tower. Entering the gates of Victoria Educational Gardens is a "wow" moment - sometimes called the best-kept secret in Victoria. As you open the gate, you feel as though you have walked into a magical landscaped world created by many different types of gardens (19 of them) each with its own variety of flowers and foliage. My sister-in-law, Linda Pierce, of Pennsylvania, stated after visiting Victoria Educational Gardens, "So full of color from the plants that thrive with some dedicated attention to Texas climate. The whole effect is joyful and representative of Texas gardening at its best." What a thrill it is to walk into the structure called Butterfly Haven. Master Gardener Cliff Knezek donated funds to help build this structure. Inside are plants associated with different types of butterflies. A plaque describing each particular butterfly species for the South Texas region can be found throughout the area. Specific plants have been planted for each butterfly species. Dill is planted for the black swallowtails. 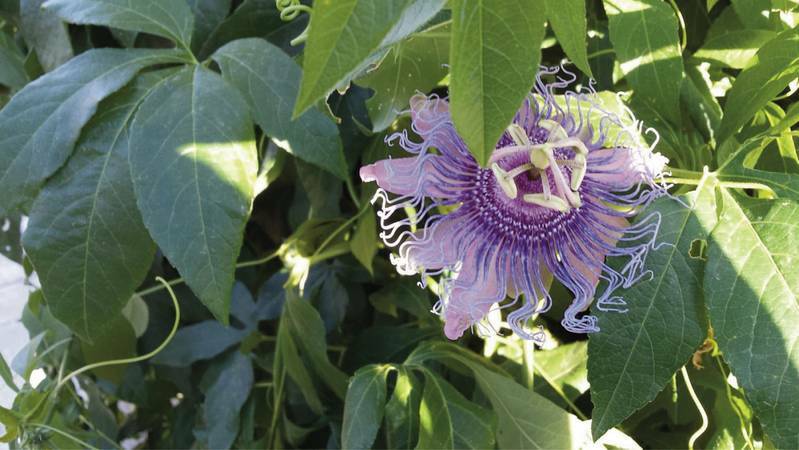 A passion vine climbs a trellis in hopes of attracting Mexican and variegated fritillary butterflies. • Victoria Educational Gardens, 283 Bachelor Drive, is across from the Aviation Control Tower at Victoria Regional Airport. • Drive out U.S. 59 North, turn left on Foster Field Drive, turn left at Aviation Circle, turn right at Piper Street, turn left on Hangar Drive and you will see Victoria Educational Gardens and the Officer's Club on the left before you reach the restored Aviation Control Tower. • Find info on Victoria Educational Gardens on the home page of vcmga.org. Follow instructions to open a new window for a map. • Victoria Educational Gardens is open daily dawn to dusk with free admission. One of 19 mini-gardens at Victoria Educational Gardens is the Military Honor Garden, where several hundred pavers have been placed by military family members or friends to honor those who have served or are serving in the military. Notice here the kiosk with all names honored and pavers placed on the walkway to the right. The project is ongoing. Click http://www.vcmga.org/2011MilitaryPavers.html for more information. 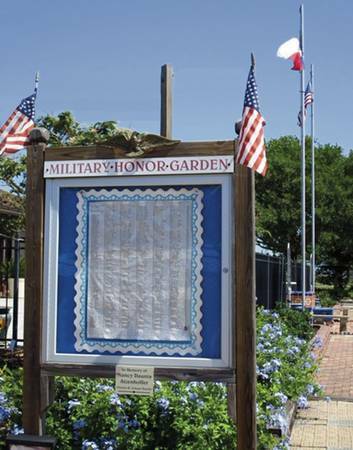 The military history of Victoria County is acknowledged in the Military Honor Garden alongside the Patriotic Garden. Pavers have been placed to honor or memorialize military family members and/or friends. A historical plaque stands in front of the former Officer's Club of Foster Field explaining the area's usage as training ground for pilots during World War II. Red, white and blue plants like the red bottlebrush, white flowers of the musical notes clerodendrums and the blue plumbago are contained in the Patriotic Garden. A koi pond has been created where the former Foster Field swimming pool existed. A variety of gardens showcase different kinds of plants. There are the turfgrasses, rose, daylily and bulb areas to mention a few. A raised bed holds examples of herbs like basil or spearmint. The Animal Alphabet Circle and Rainbow Circle each hold varieties to support their titles such as lamb's ear or foxtail fern. A special area is designated for Texas Superstars. These plants have been through rigorous testing at various Texas A&M AgriLife Research Centers across Texas. During years of testing, the Texas Superstars Executive Board of statewide experts examine in great detail a plant's ability to survive and thrive in various plant-based settings. If it survives this testing, then it can be designated a Texas Superstar. Such plants as Laura Bush petunia, New Gold Lantana and others can be found in the Texas Superstar area. There has been so much thought and planning put into the variety of mini-gardens at Victoria Educational Gardens. If you want to further your knowledge you can observe a drip irrigation system, rainwater harvesting or keyhole gardening. Seasonal vegetables can be found in the vegetable area along with an experimental way to grow them in the keyhole garden. You can take a trip back in history into the WWII past or view some birds and butterflies in their current habitats or ready to migrate onward. Best of all, it's free and open to the public whenever you get a whim to see what grows in Victoria or just to take a stroll. Just remember: look, but don't pick. We want to keep our gardens pretty for everyone to see. It's a favorite place of mine to take out-of-town visitors. My grandchildren love romping through the gardens to fill in the blanks of a scavenger hunt or to observe the different stages of butterfly development. There is enjoyment on so many different levels and for as many different interests. It's a true destination for newcomers or visitors to Victoria and the surrounding area. Come see for yourself. Alongside the Military Honor Garden is the Patriotic Garden displaying red, white and blue blooming plants and garden wall art affixed to the historic Officer's Club building. 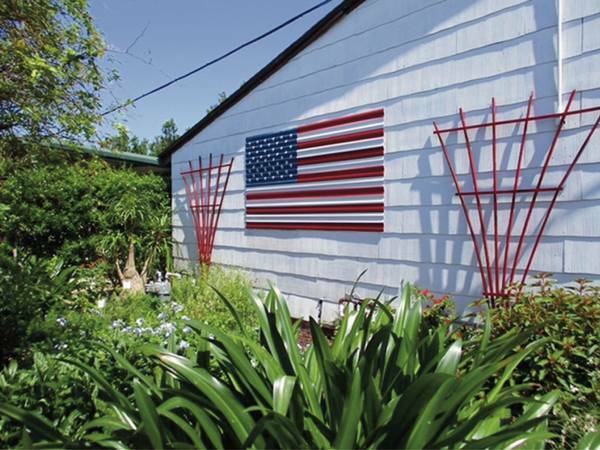 One will notice red blooms of the bottlebrush and firebush plants, white blooms on wispy spires of musical note clerodendrums and blue plumbago among other patriotic plantings below and near the mounted Old Glory flag on the backdrop wall.